Here we begin a series to address abu usaama’s recent deceitful reply regarding the incident last Friday. Once again he spoke about the two innovators Al-Maribi and Al-Halabi! Whenever he speaks about their affair in relation to the stance of the Salafiyyoon towards them, he is quick to announce his spider-web shubhah that he refrains from declaring them innovators because Shaikh Abdul Muhsin does not declare them to be innovators; however deceitful Abu Usaamah always refrains from detailing this affair to his unsuspecting audience. Finally: We have to be reminded of the fact that the students at Maktabah Salafiyyah have been translating numerous articles on various affairs of Manhaj for many years and this is all done for us to be fully acquainted wiith affairs of the Salafi Manhaj. Yes indeed, we genuinely ask questions whenever a deviant like Abu Usaamah or others similar to him spread doubts, but this does not mean that we deliberately remain unaware of certain manhaj affairs as long as nothing has occured. Rather, we should be acquainting ourselves with many affairs of the manhaj that have already been translated into the English Language by the truthworthy and honest Salafi students. 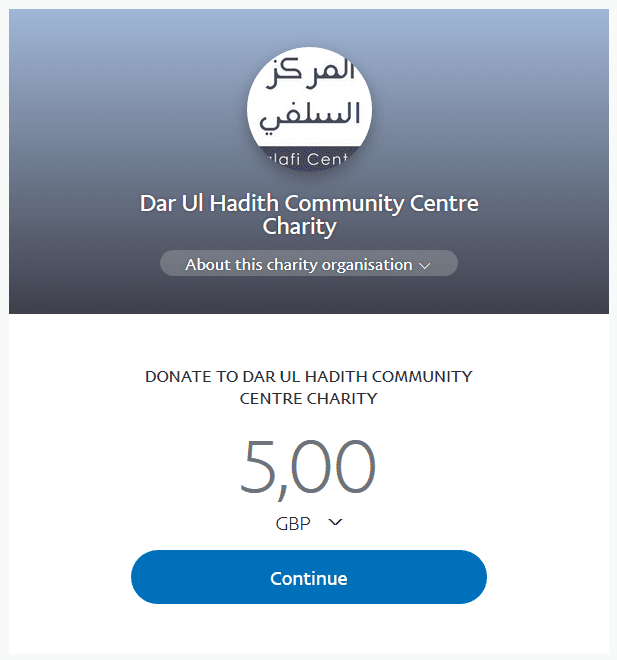 After the ‘Foundations of the Sunnah’ lesson yesterday, I was asked about an incident that occurred at Jum’uah (Fri 1st April) at the Salafi Centre; whereby inexplicably Abu Usama Dhahabi, of the deviant GLM organisation, walked in, took the microphone claiming he was the khateeb- apparently believing he was scheduled to do the khutbah there! In reality he was scheduled with the hizbees across the road (the followers of the takfeeri innovator al Magharawi, the ones who cut the phone line on Shaikh Rabee’ when he was advising them to abandon the innovator Al-Ma’ribi, etc.). He was promptly removed from the masjid. So the question is: Was it correct to remove him? We can answer this from a number of angles, that will leave no doubt in anyone’s mind that this action was correct and in fact completely necessary! So firstly: What kind of unbelievable extreme mental block and delusional state must somebody be in, to walk into a masjid, take the microphone and be on the verge of starting the Khutba… and NOT EVEN realise that it is not the masjid you have been invited to; instead, somewhere completely different?! Bear in mind, that he has been to the hizbees across the road before anyway! So it cannot be said, that he was somehow unaware of the layout of the masjid at all. 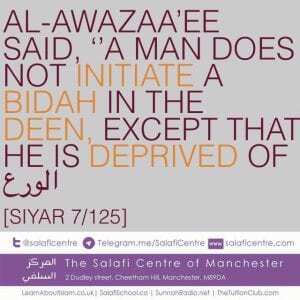 It is still perplexing and baffling to the Salafis of Manchester how his mind didn’t “click”, when he walked into a completely new and unrecognised environment to the hizbee location he was invited to even though he has ALREADY visited it previously. We can only imagine his bewilderment when he must’ve seen new faces he didn’t recognise at all, and couldn’t see any of his hizbee comrades waiting to greet him. Alas, the proverbial pennies were clearly in short supply, hence the lack of any of them ‘dropping’. Yet he proceeded still to ask for the mic to be clipped onto his collar, to begin his khutbah!Despite our utmost efforts, we still cannot comprehend how on Earth such stupidity is even possible. Secondly: Upon finally locating a penny to drop… it dropped… and the mic was removed, leaving him utterly confused, bemused & bamboozled by his (own) unbelievable stupidity. So belatedly he began to make his way out, and when loitering around the corridor, and further more being asked to leave, he muttered words to the effect of “I know how to go JAAHILIYYAH on you”. Now shocking as this may seem, it shouldn’t surprise anyone, as its what we’ve become accustomed to with this individual. We all know very well, how he goes all “jaahiliyyah” on people; and if anyone needs a refresh, please read about his restaurant nervous breakdown, where he almost beat up a couple of young brothers half his age (http://www.salaficentre.com/2014/08/abu-usamah-ad-dhahabi-glm-despicable-attempted-assault-must-read ) and Allah’s aid is sought! It is truly amazing! Can anyone imagine any of the Scholars, going all “JAAHILIYYAH” on people?! Or perhaps this is the new “hip”, “street”, “cool”, “reach-out-to-the-gangster-Youth”, vibe of dawa, being implemented by him, and his likes (the likes of Aasim al Hakeem with his “your mother” comment (https://twitter.com/1mmeducation/status/715546135335739393) and the “Dawa Men” with their infamous sperm drinking debacle). So considering all the facts, then there is no issue whatsoever in having removed him. 2) He threatened brothers with speech typically expected of a thug off the backstreets of some rundown slum… Threatening to CRACK someone’s HEAD, despite the fact that it was he who attempted to take the Mimbar & deliver a Khutbah?! Passing the blame is typical cowardice; despite it being his mistake it was the ones ejecting him who needed their heads “cracking”. This is further evidence of this mans delusional state and typical of his characteristic of being in “denial” of reality. Even though he was completely at fault for the WHOLE incident – Dhahabi cannot bring himself to accept it; and it is always we the Salafis that have to be at fault. The same Salafis who were peacefully waiting for their Salafi khateeb… until he – a man declared a deviant by Sh Ahmad Najmy – “gatecrashed” like no one has ever gatecrashed before. Indeed the group of scholars in Saudi are in a (state) of complete blindness and ignorance regarding the new problems and their Salafiyyah is Taqleediyyah (i.e. 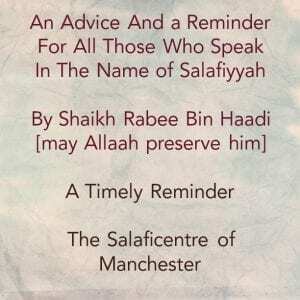 Salafiyyah based on blind following) and it is not worthy of anything. This speech is false, for indeed the scholars of Saudi are acquainted with the problems of the era and indeed they have written a lot about it, and I am from them- Bi hamdil laah! Indeed they have written in that regard that which cannot be counted (i.e. numerous) and they- Bi Hamdil laah- are among those who are the most knowledgeable of the Madhab of Ahlus Sunnah Wal-Jamaa’ah and they follow that which the Salafus Saaleh followed in the subject matter of Tawheed, Asmaa Was-Sifaat, the subject matter of warning against bidah and in all the abwaab (areas of knowledge. Read -if you are ignorant- the Majmoo’ah of Ibn Qaasim (Ad-Durar As-Saniyyah) and the Fataawaa of our Shaikh Muhammad Bin Ibraaheem (rahimahullaah). Read what we have written in that regard (i.e. the affairs of the era) in our Fataawaa and our books are widespread among the people.